Choosing to wear a veil at your wedding is a personal choice! They are so beautiful and there are so many types to choose from it can be confusing! The veils are most commonly thought of as a sign of modestly but they are really a sign roof personality and what you would like to portray. Veils are a great additive detail to your day to just make it the best! 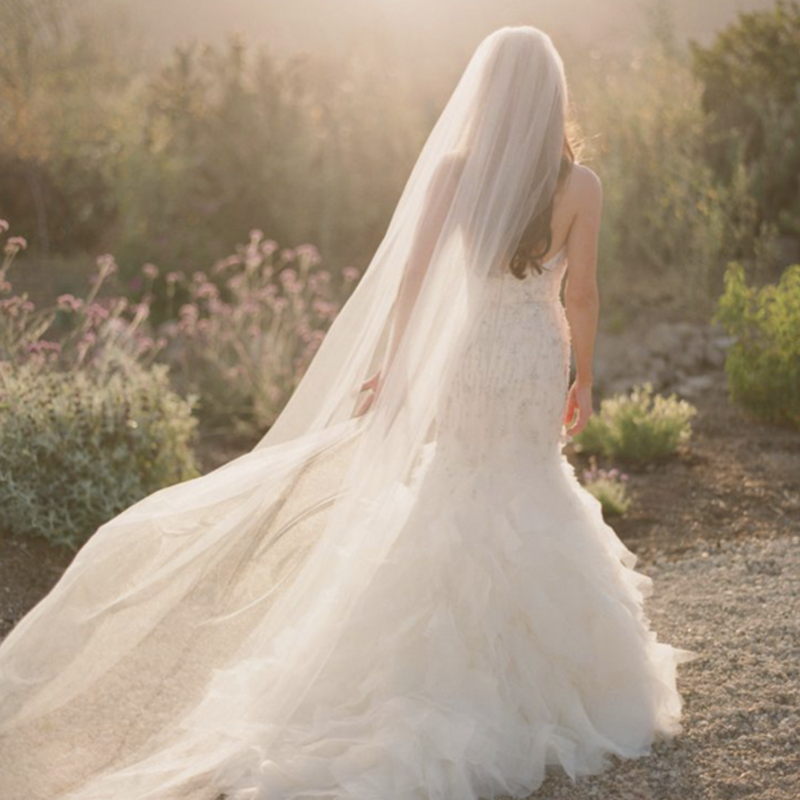 There are a ton of different types of veils you can explore: there is the birdcage, the blusher, the fly away, the elbow, the fingertip, ballet, chapel, cathedral, Juliet cap, and the mantilla. All beautiful styles in their own ways, some are meant and designed for a certain person. The birdcage is more of a personalized veil for the vintage bride, the fabric seems to bee more of a subtle pattern and very sheer. This is also a very short veil that is only meant to cover the face. Another short veil is the blusher veil, this one has no pattern but seems to be very whimsical, it appears to be flowing and very loose but short! The fly away veil is a veil that is medium in length and has a lot of volume within it, it sits further at the back of the head! The elbow veil is pretty much self explanatory, it go to the elbow and most of the time has some detailing at the ends, little lace details and beautiful! The fingertip veil is a fingertip length veil and it is a beautiful length, the flowing nature and the volume is great for any figure! There is the ballet veil that is a little bit longer then the fingertips, it falls perfectly on any body type! The chapel and cathedral veils are more traditional and typically european, they are very very beautiful and long, they usually touch the ground and add onto the design of the dress! The Juliet cap is a veil that sits closer to the back of the head, and usually has some detailing on the sides to hold it up, it is very flow and varies in length! Lastly the mantilla veil, the design is beautiful and has a lot of detail, this is once again more of a vintage veil, the detailing is lace and embroidery mostly, also being one of the shorter to medium length veils this makes a great statement to any dress! Veils are so different and unique they make the perfect decoration and little piece of detail in your gown or dress. Truly beautiful! !